The Beta-sitosterol, with the CAS registry number 83-46-5, is a kind of white powder with no odour. It is widely distributed in the plant kingdom and found in Nigella sativa, pecans, Serenoa repens (saw palmetto), avocados, Cucurbita pepo (pumpkin seed), Pygeum africanum, cashew fruit. Beta-sitosterol is insoluble in water while soluble in chloroform and carbon disulfide. As to its usage, it is widely applied in many ways. Beta-sitosterol could be used as the Lipid-lowering drugs, and it could also be used as the acridine and health food. 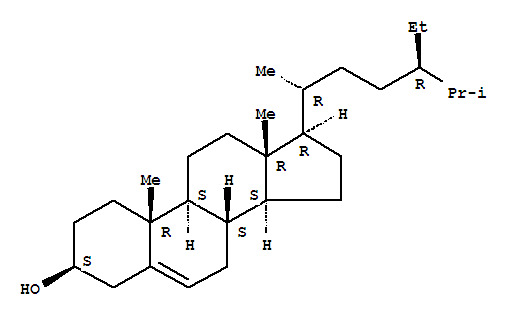 (1)ACD/LogP: 10.73; (2)# of Rule of 5 Violations: 1; (3)#H bond acceptors: 1; (4)#H bond donors: 1; (5)#Freely Rotating Bonds: 7; (6)Polar Surface Area: 9.23; (7)Index of Refraction: 1.521; (8)Molar Refractivity: 129.21 cm3; (9)Molar Volume: 424.3 cm3; (10)Polarizability: 51.22 ×10-24 cm3; (11)Surface Tension: 37.6 dyne/cm; (12)Density: 0.97 g/cm3; (13)Flash Point: 220.4 °C; (14)Enthalpy of Vaporization: 88.77 kJ/mol; (15)Boiling Point: 501.9 °C at 760 mmHg; (16)Vapour Pressure: 3.53E-12 mmHg at 25°C; (17)Exact Mass: 414.386166; (18)MonoIsotopic Mass: 414.386166; (19)Topological Polar Surface Area: 20.2; (20)Heavy Atom Count: 30; (21)Complexity: 634. When you deal with beta-sitosterol, you should be careful. For one thing, beta-sitosterol is irritant to eyes, respiratory system and skin, which may also cause inflammation to the skin or other mucous membranes. For another thing, it is harmful which may cause damage to health, and it may have danger of serious damage to health by prolonged exposure through inhalation and if swallowed. Besides, it has the limited evidence of a carcinogenic effect. Therefore, you should take the following instructions to protect yourself. Wear suitable protective clothing, then avoid contacting with skin and eyes. If in case of contact with eyes, rinse immediately with plenty of water and seek medical advice. In addition, remember not to breathe dust.